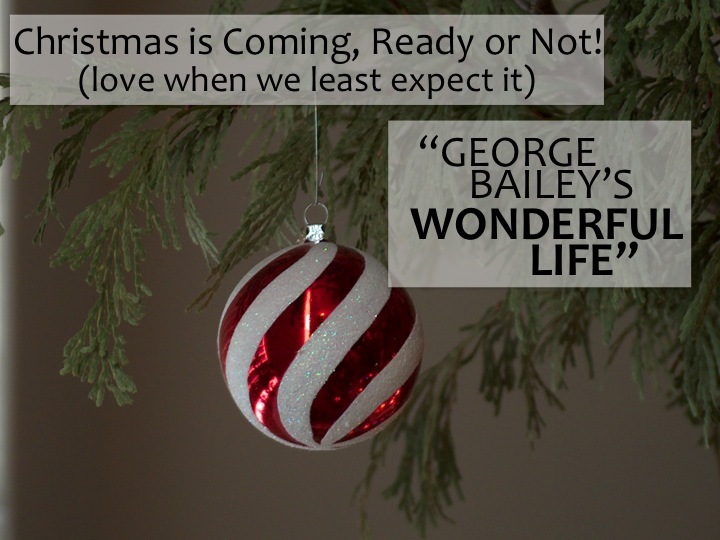 Interesting: George Bailey finds hope and love because he’s given up his own dreams, at least to some extent, to take care of his family and loved ones. It provides a sort of conundrum, does it not? The way I see it, George discovers or rediscovers hope and joy because he realizes that his life, imperfect as it is, and totally not what he had planned, is nevertheless wonderful. No matter what others might think, or how they might judge it from their outside perspective and their ignorance of his life and his heart. It’s a powerful story of growing where one is planted, finding the beauty and sacredness in life in the every day things that somehow are never ordinary. Sometimes one has to lose ones life to find and keep it. It’s not that I disagree with you at all. And it’s truly one of my favourite films. However, it makes me a tiny bit sad–the suggestion that it’s ok to simply give up on one’s dreams. I so want George to go to college or get to travel. Or is the lesson that self sacrifice is the key to peace? I mean, is George fully being his authentic self, a term that so many of us (and I’m including myself here) throw around and seem to value? Or is George giving up too much? I agree, Valerie, and I hope that’s not the message people take away from the movie. I think that’s part of what makes George such a tragic hero– we want him to follow his dreams and we are heartbroken along with him when so many of them elude him. However, he gets most frustrated when he compares himself to other people’s ideas of success– to Sam or to Mr. Potter, or even to his brother, Harry. I love the subtle but powerful contrast with Mary, who does achieve her dreams, from her whispered declarations of love as a child to her wish when she throws the rock, to her college degree (yes! She has one and George doesn’t!). Rather than resenting or being jealous of his wife, George loves her all the more for her determination I think. She knows what she wants and– as he wishes he could do– she gets it. It’s hard to say why some people follow their dreams and things work out, and some people find themselves stymied at every turn. I remain convinced that the powerful point of the movie is not so much about being true to your dreams as it is about finding your dreams in the love that’s already in your life. The near-closing line that George is the “richest man in town” is a little corny, but true. I think sometimes the challenge in life is finding excitement, adventure, and passion in the ordinary and beautiful.